The process for sending electronic claims is the same no matter what clearinghouse you use. Before sending claims, whether test or production, you'll need to setup your client's insurance billing information under Clients (button at top) > Details > Billing & Insurance (tab at top of page). You also need to make sure that the client has a Progress Note for appointments and Diagnostic code(s) in their notes. Claims are generated from invoices, so to send a claim, you'll need to create an invoice and then send the invoice to the clearinghouse as a claim. The easiest way to create an invoice is to schedule a client. Go to Calendar and schedule an appointment with a client. Make sure the appointment is associated with a service type and a client. 2. 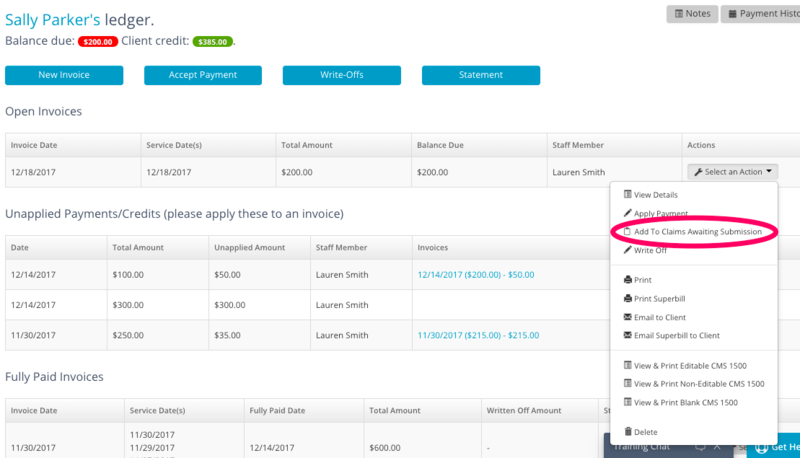 You can now create an invoice. Click here to learn how to create an invoice. 3. In the invoice, make sure you select the appropriate provider or leave blank if you're billing with a Organization/Facility NPI. 4. Once the invoice has been created you can add it to "Claims Awaiting Submission." This options appears in the Select An Action drop down next to the invoice. 6. We must check claims for basic errors before they can be sent to the clearinghouse. You can select all claims by checking to top check box or if you only want to submit selected claims you can select the box next to each claim. 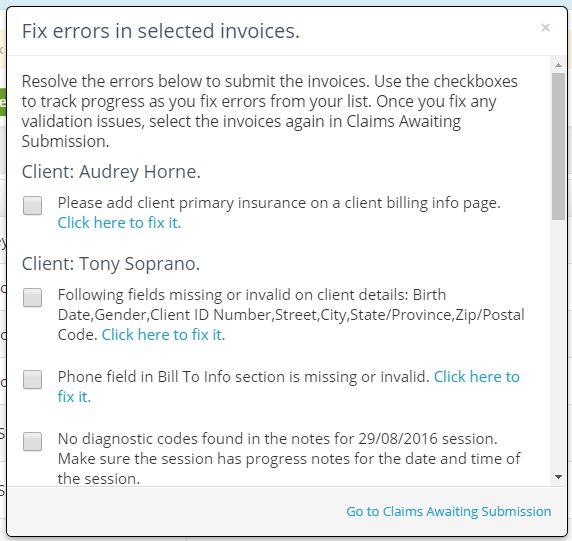 Once all or certain claims are selected click the Check Selected Claims for Errors button. 7. You will be prompted to fix any errors in a selected claim. You can click on the blue hyper link in each error to fix it. If you wish to go ahead and submit claims that do not have an error click Go to Claims Awaiting Submission > Select all claims> and click "Submit Selected Claims." 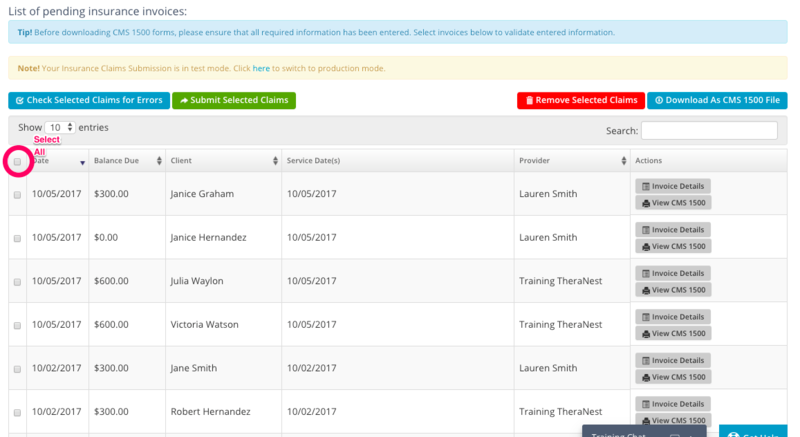 You can now go to the submitted claims page to review any submitted claims or fix the remaining errors.